THICK pork chops. Bone in. Two per package. Package weight approx. 2-3 lbs. Frozen, vacuum packed. 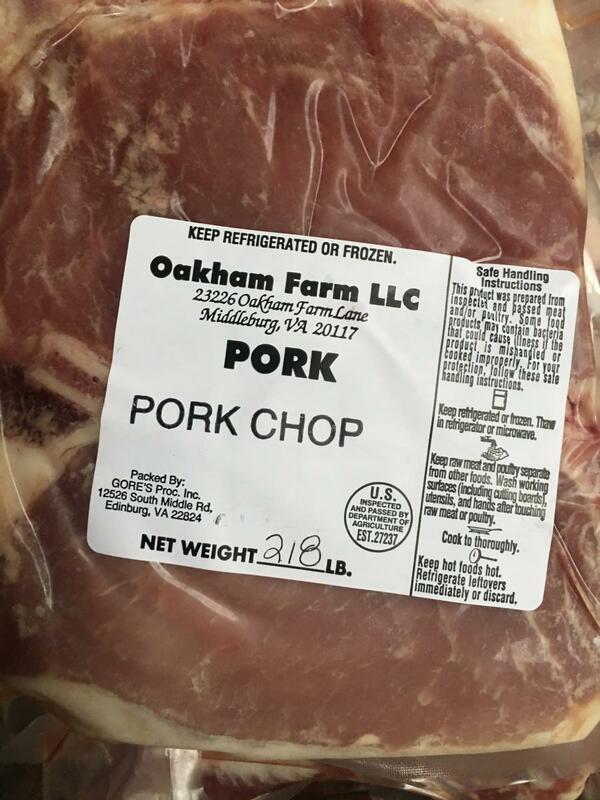 You can taste the heritage and husbandry in our pork from critically endangered Ossabaw Island stock. Chefs love the flavor and texture of the abundant silky white fat, and the ruby-red flesh. You will love knowing that the animals lived as nature intended, ranging deep into the woods to feast on nuts, foraging for roots and shoots, and basking in the sun on cooler days. Oakham Farm began in the 18th Century on a road established in ancient times by pre-Columbian Americans. With the work of enslaved people, it grew into a prosperous, diversified Virginia plantation that was a microcosm of the antebellum south, a self-contained community with workshops, fields, an orchard and a mill. As Oakham Plantation it was a hotbed of confederate partisanship during the civil war and the birth-place of Mosby’s Rangers. During the roaring 1920’s it was the domain of a strong, progressive woman who was a leader in the community, a philanthropist, and a pioneer in preserving the unmatched beauty of the Virginia piedmont. Now, in the 21st century, Oakham is once again a self-sufficient powerhouse, fueled by the sun and by women and men of diverse backgrounds who share a vision of sustainability, diversity, sanctuary and plenty.